The eNotes Blog: New to eNotes: Annotated eTexts! 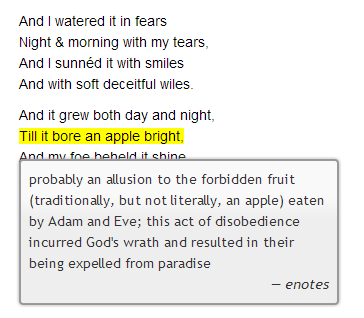 New to eNotes: Annotated eTexts! For a long time at eNotes, we’ve displayed eTexts on the site–entire works that anyone can access for free. But recently we’ve worked to make them even better. Welcome to our all new Annotated eTexts! Have you ever underlined words or made notes in the margins of your books while reading them? These notes help to re-familiarize you with a passage of text when you flip back through it, or draw out evidence that points to a novel’s main themes. Well, now those notes are made for you, and by the very same teachers who expertly answer your questions in eNotes Homework Help. With real teachers and professors helping you with your homework, how can you go wrong? Pick a work from over 120 Annotated eTexts on this list. A full list of all of our eTexts can be found here. Both lists are alphabetical. eNotes’ Annotated eTexts cover novels, poems, plays, and more! Plus, many more from Poe, Shakespeare, Dickens, and more to come soon! Explore them all here.